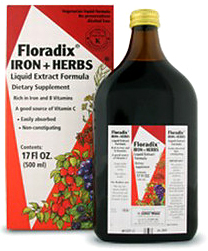 Floradix: a quality iron supplement. 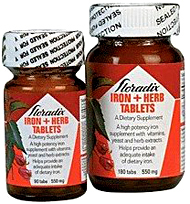 The absorption rate of Floradix (liquid iron gluconate) is twenty-five per cent compared solid iron tablets that have an absorption rate of two to ten per cent. 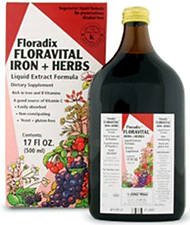 Floradix provides maximum absorption by using the most highly absorbable form of iron, iron gluconate. 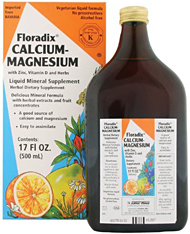 Floradix also contains B vitamins and vitamin C to enhance absorption, herbal extracts to increase digestion, and fruit juices to ensure proper stomach acidity. A twenty milligram dose of Floradix satisfies the Recommended Daily Allowance (RDA) of fifteen milligrams of iron for women of child-bearing age. Iron is essential for hemoglobin formation and for the effective circulation of oxygen throughout the body. Without adequate levels of iron in the blood, one will be left feeling lethargic and tired. Women are more likely to suffer from anemia and low blood-iron because menstruation, pregnancy and breastfeeding tax their iron stores. Vegetarians are at higher risk of developing iron deficiency and so are those who eat little red meat. Aqueous extract from: carrot, nettle wort, spinach, quitch roots, fennel, ocean kelp, African mallow blossom. Adults (12 and over): Take 10 ml (measuring cap or two teaspoons) twice daily before meals. Children (4-11 years old): Take 10 ml (measuring cap or two teaspoons) once daily before a meal. Shake bottle well before using. Take before meals. For Kosher use: Mix 10 ml (measuring cap or two teaspoons) into half a glass of water or juice.